Search My Ancestry: How did your ancestors decorate for Christmas? 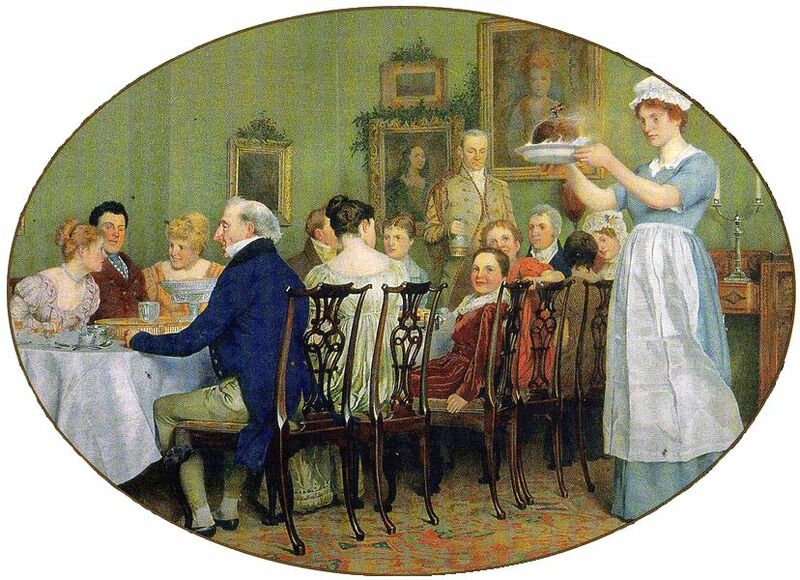 Greenery and fruit, sparkle and snow, colourfully-dressed tables and walls inscribed with Yuletide mottos - Christmases past were decorated using much the same general combination of ideas as Christmases today. But the specifics of the way our ancestors decorated their homes at any given time in the past depended not only on tradition, but also on what was currently most novel and up-to-date. A typical home at Christmas in the mid-Victorian period, would have been decorated to draw the eye towards the fireplace, which would have been ablaze with colour and sparkle. The popular installation of a Christmas tree in the domestic environment was widely attributed to a widely publicised etching of the Royal family at Christmas, complete with a tree (decorated with tinsel made from real shavings of silver) in the London Illustrated News of 1848. Mottoes or biblical quotations, with the individual letters cut out from paper and decorated with coloured rice or cotton wadding to imitate snow were often strung across the walls. Trees were decorated with ornaments made from lace, paper, scraps of newspaper and magazine illustrations. 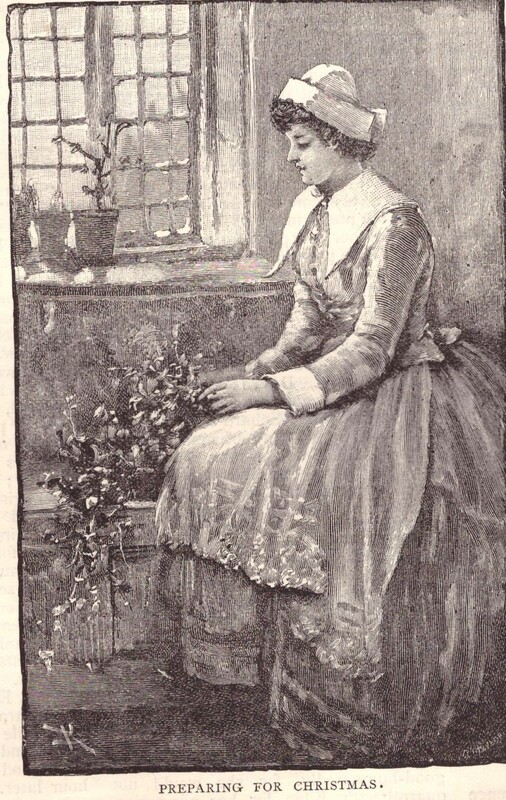 Girl's Own Paper December 20th 1884, Vol VI, No.260. An ancestor might have started preparing for Christmas many days or weeks before the event, and there was plenty of advice around to suggest just what tools he or she would need to make a good job of it: ‘A good deal table to work upon is an essential; some stout brown carpet paper for cutting out letters or making backs for monograms and medallions; cardboard for suspended letters; wadding to imitate snow; strong twine; fine wire; a few old barrel-hoops; some whole rice uncooked; red sealing wax; spirits of wine; needles and woollen threads, scissors; hammers and tacks, are among the domestic trifles which come in usefully. Supplement to the Sheffield and Rotherham Independent, December 24th, 1881. 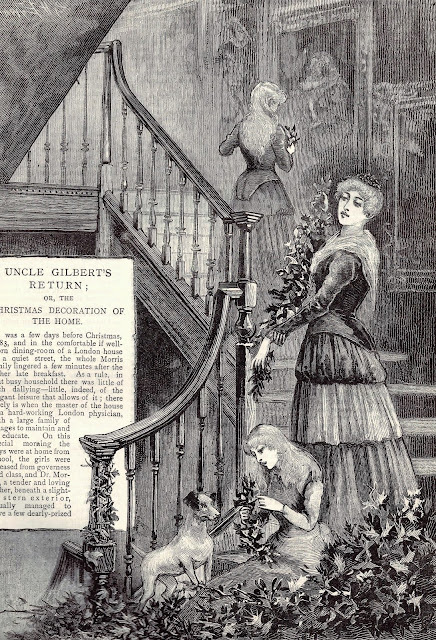 By the end of the Victorian period, Christmas had become big business. 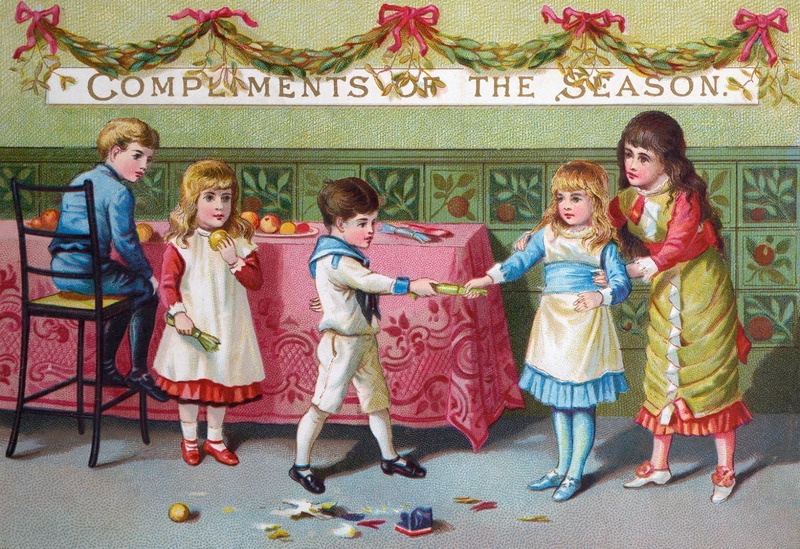 Homemade decorations were supplemented in wealthier families by shop-bought items. The image of Father Christmas, as a prolific gift-giver - rather than simply in his old evocation as an expression of festive hospitality - appeared frequently in the press, on cards and other festive paraphenalia. New department stores across the country stocked up with the latest glass and lead toys and baubles many of which were manufactured in Germany, (though, even as early as the 1890s, some came from the East). Conway, Jones and Co. of Northgate in Gloucester, was typical of a small family-owned shop which boasted a Christmas window full of ‘thousands of clever Japanese toys and novelties suitable for Xmas trees and bazaars, at 1 d each.' The Citizen, December 18th 1897. The boon in decorating for Christmas went on right through the Edwardian period at which time, every nook and cranny became a possible location for ornamentation: mantelpieces sported homemade convex wire cages, through which ‘the stalks of ../ flowers, holly, etc’ could be passed,’ trellis decorations surrounded doorways, wooden hoops trimmed with holly hung from ceilings, and (the middle-classes in particular) sought to outdo each other with decorated friezes and dado rails. Once the War was over, however, our ancestors returned to decorating their homes with renewed zest and an eye for modernity. Cellulose paper (first manufactured in Britain in the 1930s), was newly popular because it sparkled in firelight or electric light, artificial tinsel garlands were at the height of their popularity and aluminium Christmas trees arrived in 1955. Plastic novelty ornaments and tree decorations could be purchased cheaply from Woolworth’s (the American-owned emporium increasingly to be found on every British high street). The festive celebrations of the 1950s gave a focus for the mixture of nostalgia, patriotism, but most of all, the optimism, that characterised the decade. Christmas, of course, is a peculiar time when we are wont to reflect that both everything and nothing remains the same. It’s perhaps comforting to know that our ancestors, like us, always welcomed the festive season by experimenting both with natural ingredients and traditional ideas, and with new materials and novel technologies. Long may it remain a magical combination! If you have enjoyed this article, why not follow me for more creative approaches to family history? And don't forget to enter your email address in the box on the right to follow this blog! Mark Connelly, Christmas: A Social History, I.B. Tauris, rept., 2012. E. G. Lewis, All Things Christmas: The History and Traditions of Advent and Christmas, CreateSpace Independent Publishing Platform, 2012. Clement A. Miles, Christmas Customs and Traditions, Their History and Significance, Dover Publications, 1976. Rev. James Woodforde, A Country Parson: James Woodforde’s Diary, 1759 -1802, Century, 1985.